Welcome back! In Part 1, we discussed all the basics of selecting a goat and acquiring the equipment. We also went over preliminary training for your selected goat. Now we’re ready to start training, so let’s get to it! Whatever words you chose, make sure you stay consistent with your choices. This will come in handy later on. Training note: Make sure training is always a positive experience for you and the goat. Goats can tell when you are stressed, which makes the experience negative. 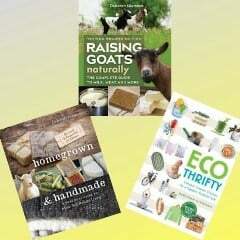 Keep it fun and upbeat to get the most out of your goat! And make sure you are rewarding your goat with vocal praise and a pet. Treats may be used, but can be dangerous when the goat is on harness and cart and believes it deserves a treat. Take caution in how food is used as a reward. Once your goat is collar trained, you can begin working with your goat on halter. Begin by allowing your goat to become familiar with the halter. Let the goat wear it for a few minutes SUPERVISED for 1-2 days. 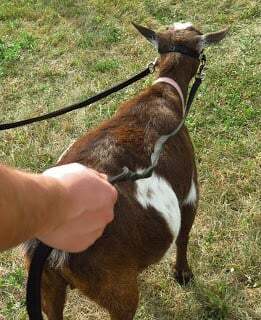 Once it becomes calm with a halter, attach a lead-line to the center ring and begin walking your goat on halter with a firm grip on the line and standing very near to the goat. Let it adjust to the feel of being led from its head, rather than its neck. When you start moving, make a turn, stop, or back-up, reinforce this with your vocal command. Work with your goat 5-10mins each day for a 1-2weeks on halter training until it becomes comfortable and is responding to commands. Always make sure you and your goat are both ready to move onto the next step before proceeding. This is the slowest part of training but pays off in the end when are ready for a harness and cart. Once halter-trained, begin standing behind the shoulder of your goat and use the vocal commands like before. Work with your goat to a point where you are standing behind the goat completely and it is following commands in front of you. At this point, you will want to have the both reins attached to each side of the halter as if you were actually driving your goat — because you are! Keep the reins loose unless you are turning or halting your goat. This will take another 1-2weeks or more, depending on your goat’s personality. The point of this step is to simulate actual driving and prepares them for what’s next. 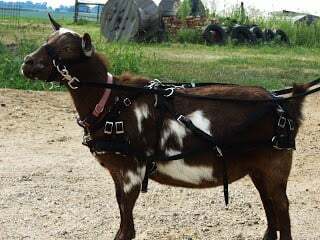 After you have successfully trained your goat to drive on halter, harness the goat up fully with reins running through the loops on the back pad. Begin driving your goat with a full harness to get your goat comfortable with the source of the rein tension, which becomes its back. Remember to keep lead-lines loose at all times unless turning, backing, or stopping. This should take no more than a week to reinforce the training. Once you have reached this point, you have successfully harness trained your goat. Your next step will be cart training, which we will discuss at greater length in PART 3. 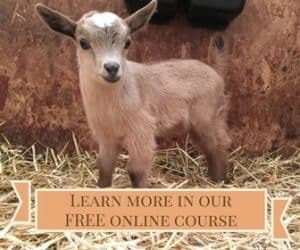 Continue reading about training your goat to be the next great working goat: Part 1: Your Journey Begins Here; Part 3: Putting the Cart Before the Goat; and Part 4: What Now? Hi your series is great. Would you mind if we shared it with our 4-H kids? Our county is growing its harness and pack program and you have lots of great insight? You are always free to email links to blog or forward posts or post on Facebook or other social media. If you are wondering about printing out the posts and sharing them with the 4-H students, I'd want to ask the author about that. Yes! You are quite welcome to share these posts with your 4-H group and anyone else who wants to learn! After training my goats, my local county 4-H has also added this to their fair as well — exciting to see it grow in other programs! Best of luck! And let me know if you have any questions! 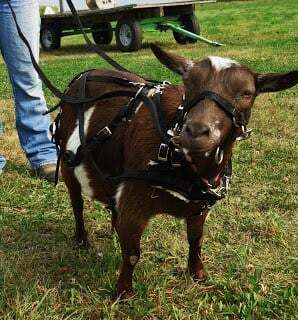 Hi there, Love the series about training a goat to cart…please can you tell me where I can purchase the goat halter/bridle shown in the photo above? If you would just like a halter for early training purposes, any standard goat/sheep halter will suffice. You can even attach thin leashes to the sides if you want the rein effect. A cheaper option for those wanting to try it out before spending the money. What is the type of halter shown here? I am interested in teaching my sheep to pull and like the design. Where can I get the harness and the rest of the stuff I need to start out?